In the GCSE exams, chemical formulae are often given to you in the question. But occasionally you’re expected to write the formula for a molecule or compound based on its name. This can be a challenge, so here’s our guide on how to approach it. Remember our top three tips for each type of compound… and writing chemical formulae will never be a problem again! First off, decide if the compound is covalent or ionic. Remember that covalent bonding happens when all the elements in a molecule are non-metals (e.g. carbon dioxide, water, ammonia and methane) while ionic bonding happens between a metal and a non-metal (e.g. sodium chloride, magnesium oxide). You just need to learn and remember these seven. They are Hydrogen (H2), Nitrogen (N2), Oxygen (O2) and all the halogens: Fluorine (F2), Chlorine (Cl2), Bromine (Br2), Iodine (I2). Have a look at the diagram below. Tip 1: Work out the charge. 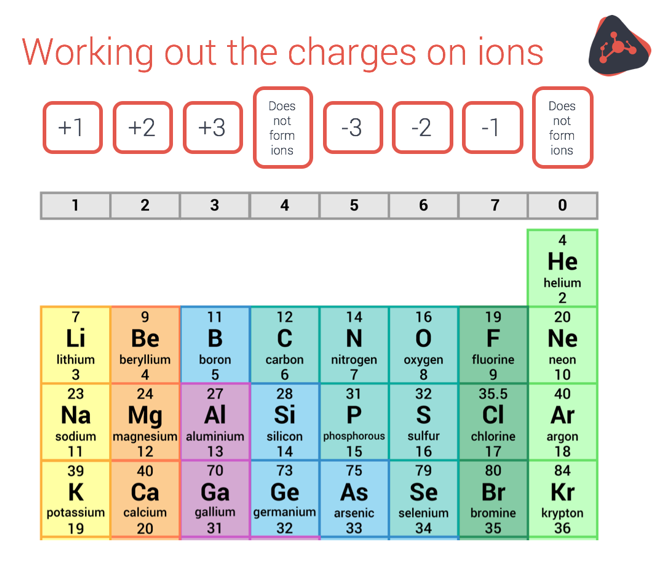 The first step is to work out the charge on the positive ion and the charge negative ion based on how many electrons those atoms gain or lose to get a full outer shell. Use the diagram below to help you. 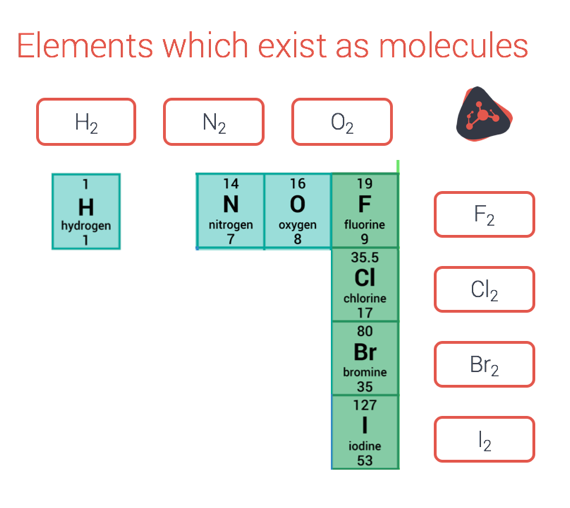 Note that the noble gases (aka Group 0 or 8) already have a full outer shell, so they are very unreactive and almost always exist as single atoms. Therefore, the charge of the positive ions needs to cancel out the charge of the negative ions. 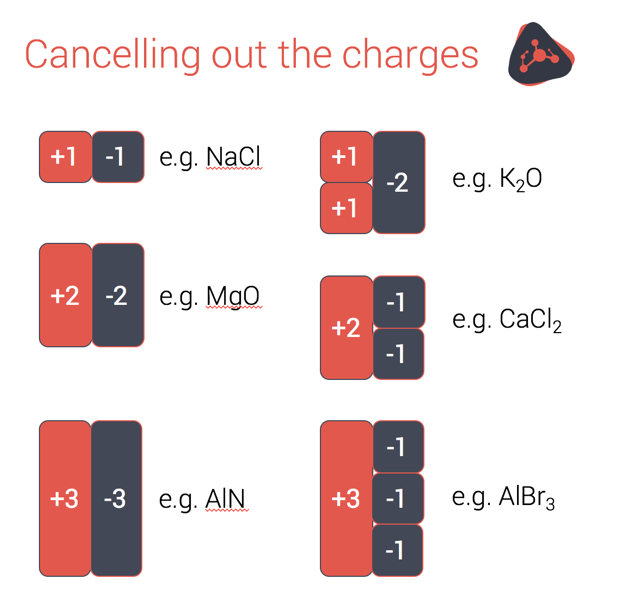 This is straightforward if the two ions in the compound have the same but opposite charge. For sodium chloride Na+ and Cl– become NaCl and for magnesium oxide Mg2+ and O2- becomes MgO. 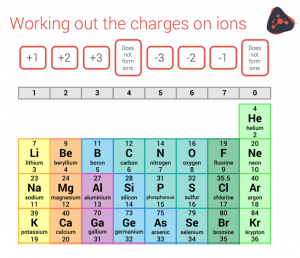 But if the two ions have different charges you need to use a few more brain cells to work out how many of each ion you need so that the charges cancel out. Examples are hydroxide (OH–), sulfate (SO42-), nitrate (NO3–), carbonate (CO32-) and ammonium (NH4+). You just deal with these complex ions in the same way – the aim is to cancel out the positive and negative charges. But if there is more than one complex ion, you may need to use brackets. For some more advice about this, see our blog post ‘Using brackets in chemical formulae’, which will be published soon. That’s it! Remember these tips, get some practice and writing chemical formulae will never be a problem again.